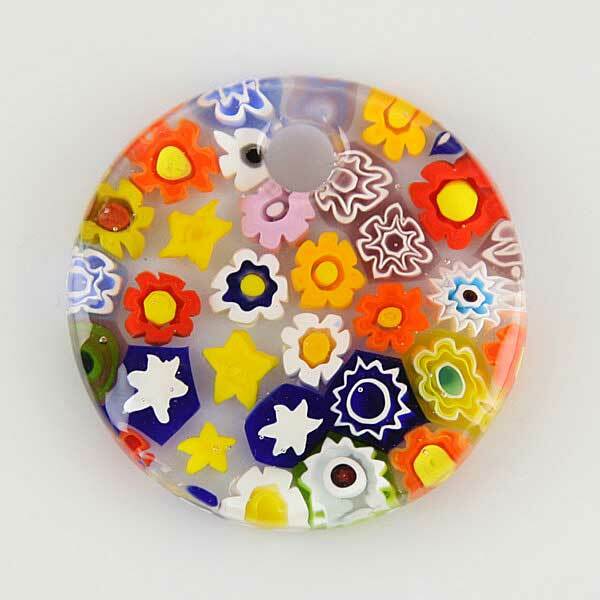 This gorgeous pendant makes use of unique Murano technique- Millefiori (a thousand flowers)- that has become a trademark of Murano glassmaking. A dazzling array of various shapes in bright colors fused together is reminiscent of beautiful ancient mosaics, fine examples of which can be seen in Ravenna, Italy. The distinct design of this pendant spells sophistication and style and attracts attention in any setting. This timeless piece of jewelry will look great suspended from a gold or silver necklace, or a colorful cord. The pendant measures 1 1/4 inches in diameter and comes with an attractive velvet pouch and a certificate of authenticity. Mosaic Glitter millefiori pendant is a part of Mosaic Glitter Collection. The unique Millefiori technique was used in the Roman times, then the secret to it was lost, and later re-discovered in Murano in the 15th century. To produce the millefiori decoration Murano glassmakers use a short metal rod with a small amount of heated glass at its end, which is then repeatedly recolored and dipped into a star-shaped mold. At the end two pieces of such glass are fused together and thinned out to create the famous millefiori pattern. The result is a remarkable fusion of vivid colors and shapes that is reminiscent of the glittering mosaics of the ages past. Item was larger then I thought it would be. Wanted some a little smaller in diameter.